Origin of kennel name: Taranka is called gamekeeper's lodge and a hill above it by the river Sazava. This uncommon name is of celtic origin, the name is inspired by the name of celtic god Taranis. Taranis had also his own sanctuaries on hills and above rivers meanders and as well Taranka is situated above Sazavas meander. Gravemouns which were discovered here support an ancient celtic settlement. 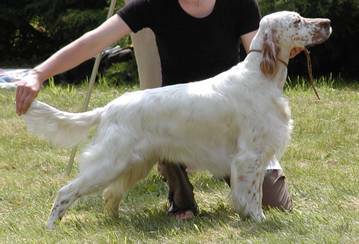 Although my kennel has this name since the very beginning, when I had no idea about brittany, I began to breed brittany, the breed that has its bases in the celtic ethnicum. 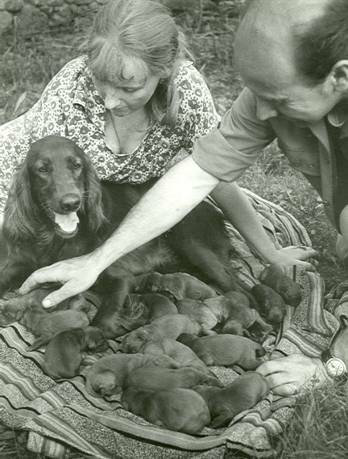 Objectives: My aim in breeding brittany since 1982 is still the same. I have my own criteria, which I strictly follow. My aim is to breed healthy puppies, that are typical in exterior as well as in character and talent for hunting, puppies that cooperate with hunter while hunting, race with its friend in agility, or will be used in custom police. Great qualities of the breed already found last mentioned organization and one of my puppies was used as a police dog in Hungary. My experiences: Brittany is very ofen marginalized on the shows in exterior - judges focus on another breeds and brittany is secondrate breed for them. That is why Klub bretanskych oharu invites on its shows judges specialists, from CZ and abroad. Result from this show is therefore very valuable and titel is merited. These titles usually get dogs from our kennel „z Taranky“. Hunting gifts of brittanies are, as it was mentioned before, very well developed. But for keeping these gifts dog doesn't need to be strictly trained. For keeping these gifts is necessary to exam young dogs that aren't influented by training. If we keep on with breeding with dogs that have an excellent hunting gifts, then gifts are keeping and getting better. 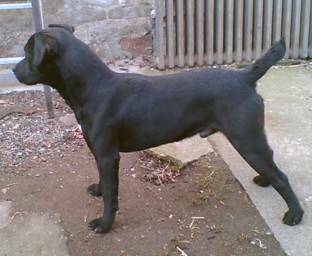 The fact, that three times dogs of our kennel "z Taranky" had succesfuly represented the Czech republic in Worldship in hunting with pointing dogs, keeps me to believe it is a correct oppinion. We are the only kennel in the CZ, which can pride of such number of succesful repserantants in category of continental pointing dogs. 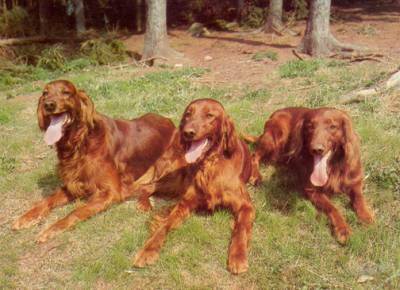 My first purebreed dog, which I could have after finishing secondary scholl, was female of irish setter „ELIS z Mracnice“. She was an excellent working dog, which teached me as well as I teached her. Outcome of our try were unforgotable hunting experiences, which led us to company of hunters. 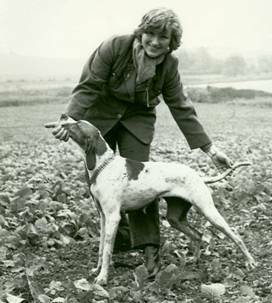 After Elis her excellent daughter „Amie Rocky Top“ followed ( registered in that time famous kennel of my father ), with her I succesfuly took a part on all hunting examinations, which were at that time for pointers organized (ZV, PZ, LZ, SVP, VZ, FT). 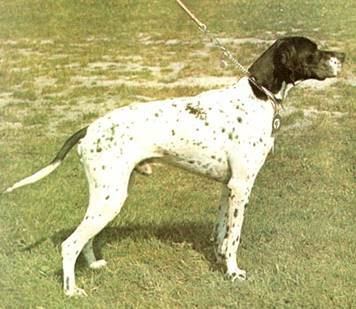 "Ch.Vigor Nonstop, Dreamy Rocky Top and Lonnie Rocky Top" - "This was the beginning – with Elis z Mracnice" - "The first litter „Rocky Top“ 1971"
In 1975 I became owner of beautiful pointer female, Champ. „Brita z Polnika“. Although I got her in older age, she had been more than one and half year , she became very succesful trialer and founder of my breeding of pointers. 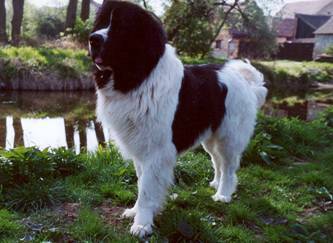 Her son from her first litter, „Adonis z Taranky“, was much-sough-for stud male, but he was more all-round, than trailer. He got the title Club winner on clubs all-round exams. "Ch.Brita z Polnika" - "Ch.Brita z Polnika" - "Adonis Z Taranky"
In 1978 I got, from my slovakian friend for help with training his english setter, two females of until that time for me unknown breed. Their looking and character reminded me a mut the most. But as soon as we began to work with them, we found out that these "muts" have great not only hunting gifts. 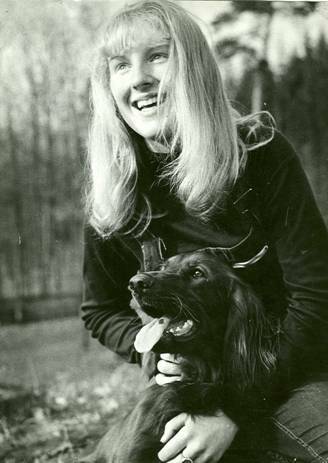 And so then in 1978 BRITTANY came not only to my kennel but in to my heart as well. Their names were Kitty and Karmen „Havranica“. But it took four years more before I could have my first litter of brittany of Kitty, sired by „BECAR“ (import from Yugoslavia). 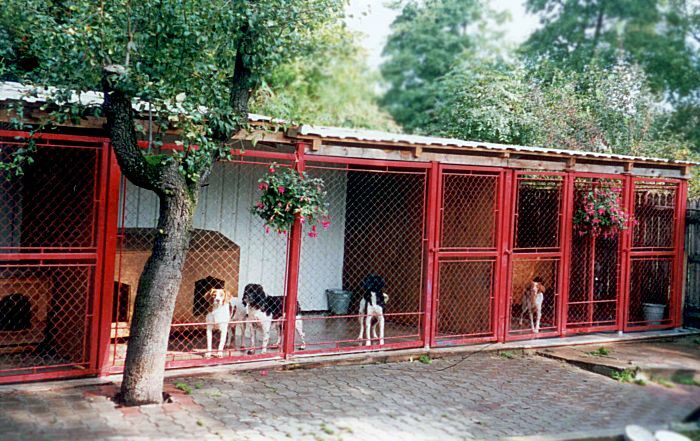 Like this started next period of my kennel with brittanies who lived with me and worked with me. Each of them was something special, but all had something that connected them – so much typical vital happy and friendly character. In 1987 I bought female of Cavalier King Charles spaniel as a pet for our family. 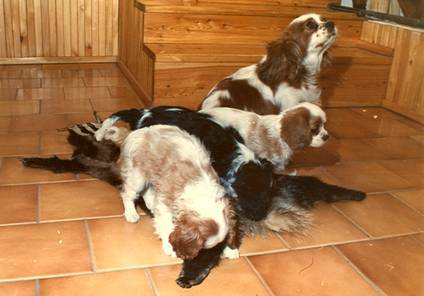 I found out with my big surprise that cavalier and brittany have many in common – not only colour varieties, they are very cheerful, mixy and both are good hunters. An so I have been seen in hunting practice also with "hunting" cavaliers. 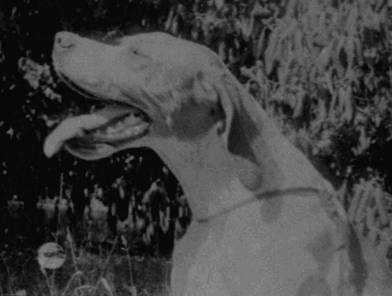 But after death of „Jakobinka z Goyova obrazu“ and her daughter „Agnes AKTARK“ I did not have next "hunting pet", although til now I am big fan of the breed. 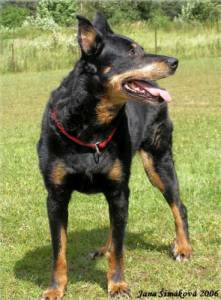 I have to add one dog that lives, sleeps, eats and hunts with us - irresistible real all-round dog female of the breed beauceron, „Stampa de la Tuille au Loup“. She learnt all work, that is required from hunting dog in practice, from other hunting dogs alone. Today she helps me to train young brittanies and gives them her experience. If brittany didn't exist, my favourite breed would be beaucerons. 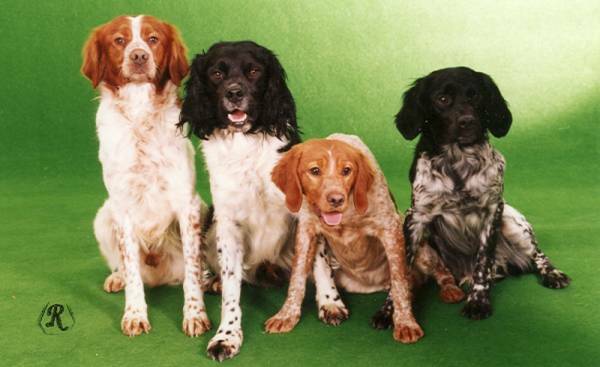 Except breeds mentioned above we owned also other breeds – Small münsterlanders, with whom my husband worked, Bohemian wire-haired pointing griffon, German pointing dog, wonderful landseer, several english setters, which breeds our daughter-in-law on very high level in kennel Vis Tranquilla. 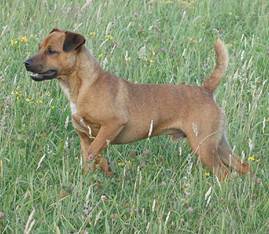 Now I also use in practice next really all-round breed, breed, which is not FCI recognized though it is an ancient breed of formed character and great working abilities – patterdale terrier. At the moment I work with three dogs of different age and I can honestly say, that so much all-round small breed I have never seen. "english setter Arachne Vis Tranquilla	" - "Landseer Surcouf du Domaine de Val Kurlande" - "Patterdale terriers Aris and Risa"